Don’t you love this classic story? Doll COCO is giving away all 5 mesh avatars prop for FREE at the main store. I went there to get the package, and found a wearable Dorothy mesh avatar inside, too! 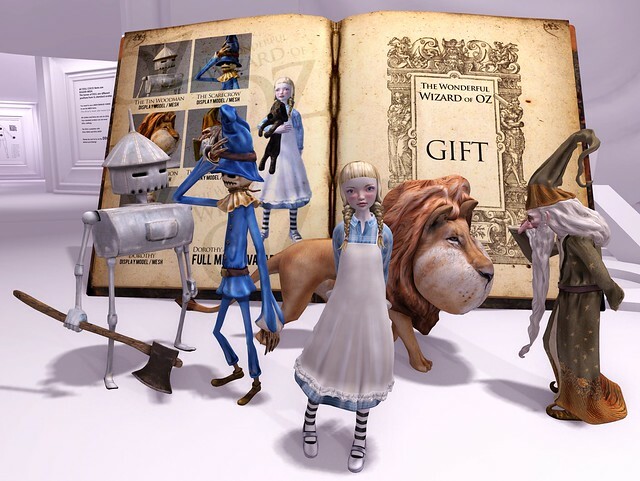 A wearable Toto is included, so you can wear that with your regular avatar (if you don’t want to be Dorothy). Oh, this is awesome! Thanks for mentioning. 🙂 I love stuff like this. You should mention that Coco has a lot of new mesh clothing worth checking out at her clothing store. I recommend that people join the update group–Coco is famously generous in giving a lot of very nice clothing gifts to her group members.